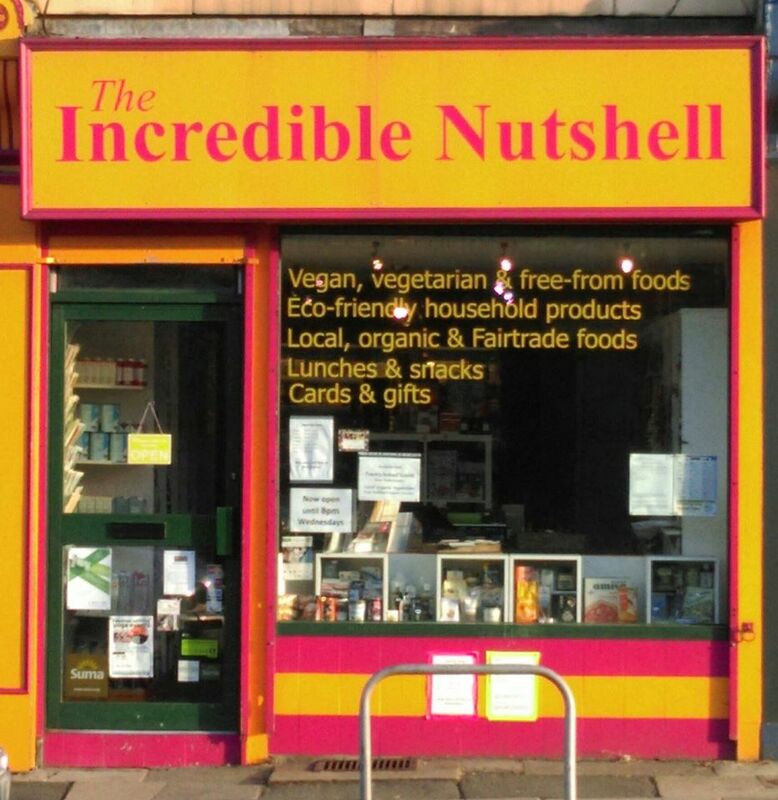 We aim to make the shop a destination for people all over Sheffield and surrounding areas who are seeking all sorts of delicious foods which are suitable for vegans and vegetarians or ‘free from’, including gluten-free, wheat-free, dairy-free, egg-free and soya-free products. A number of products are also organic or Fairtrade. We offer local Sheffield (or nearby) products including fresh bread and crumble slices from local bakery Perfectionery (Sharrowvale Road), Just Preserves jams, chutneys and pickles, Savvy Spreads date and chocolate spreads, loose leaf teas from Birdhouse Tea Company, Catherine’s Choice jams and chutneys, Tanjero handmade soaps, High Peak Brew Co. beers and Ananda Foods ‘Round Up’ vegan wagon wheels and handmade marshmallows. Regular gluten-free foods include Doves Farm, Eskal and Buona Vita gluten-free pasta (taste tested and approved by us! ), a wide range of gluten-free flours for baking, tinned ready meals such as veggie chilli, green curry and hotpot, Amy’s Kitchen frozen ready meals, Secret Sausages and Wicken Fen veggie sausages, Lazy Day cake slices, Against the Grain and Doves Farm cookies. There are ready-to-eat lunch foods including wraps and sos rolls from Forest Foods, Delphi salad pots, soft drinks, crisps, flapjacks and lots of other sweet and savoury snacks. If you’re looking for vegan, gluten-free or dairy-free foodie presents for someone, we have a selection of delicious dairy-free and vegan chocolate bars, bags and truffles, gluten-free biscuits and cookies, or how about some locally-produced loose leaf tea or marmalade? We are now licenced to sell alcoholic drinks and offer a selection of vegan and organic wines, beers and ciders. We also have a wide range of eco-friendly and animal-freehousehold cleaning products and toiletries, including Bio-D, Ecozone and Ecoleaf cleaning products, crystal deodorants, the Faith in Nature range of shampoos, shower gels and bath foams, Skin Blossom organic and vegan shampoo, conditioner, body lotion, bath soak and handcream, Hurraw lip balms, Natracare hygiene products, plus Suma and Tanjero animal-free natural soaps. Other non-food items include Viridian vitamin supplements, The Vegan Society’s Veg1 multivitamin, bamboo socks, animal-free incense sticks and candles, handmade cards and unique jewellery. 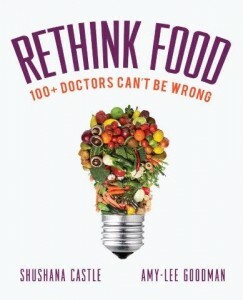 As the title of this book so aptly states, the time has come for scientists and physicians who want to effectively treat the cause of diseases – not just to deal with symptoms – to rethink food.”Michael Klaper, MDWe have been led to believe that meat and dairy are the foundation of good health. This is a myth and the science can no longer be ignored. Rethink Food brings you 100+ doctors from around the world who substantiate why all animal based products are damaging to our health and should be completely removed from our plates.From the Ivy Leagues of Harvard, Princeton, Yale, and Cornell to the UK, India, Germany, Italy, Brazil, Mexico, and New Zealand, ReThink Food’s experts explain how we can reverse heart disease and diabetes, eliminate food allergens and autoimmune diseases, live pain- free from arthritis, prevent Alzheimer’s, and even bring cancer into remission. Challenging the status quo, these doctors substantiate how each and every chronic condition covered is DIET RELATED.The science is clear. Rethink Food’s doctors conclusively prove that a diet based on whole, plant-based foods is most directly linked to excellent health, wellness, fitness, and longevity.Did you know that cow’s milk doesn’t actually promote strong bones? The truth is high dairy consumption is most associated with high rates of osteoporosis. While we have been constantly told animal protein is good for us, these prominent cardiologists, weight-loss surgeons, and diabetic experts demonstrate how our excessive animal protein consumption is associated with diabetes, kidney failure, heart disease, fatigue, autoimmune diseases, increased risk of obesity and shortens life. With all of the misinformation surrounding our children’s health, we can finally put to rest the confusion over what to feed our children. Our doctors confirm that nutrient rich, plant-based foods are the best for our children’s healthy growth and development.Former Olympic, NBA and NHL players as well as celebrity trainers in Rethink Food demonstrate how we can achieve peak performance powered by plants.